Site flow lines were virtually unchanged. Bio-swales perform a pivotal role in expanding infrastructure development. The idea is simple and important: trap pollutants like trash, oil and chemicals on-site before they become concentrated in storm drains and flow into nearby streams, rivers, and eventually the ocean. They also mitigate stormwater runoff flows and contribute to groundwater recharge. They are becomming common features in parking lots, street parkways and along drainages. Typically, they are low sloping swales with grasses or wetland plants that slow down the flow of water, catch pollutants and recharge groundwater. 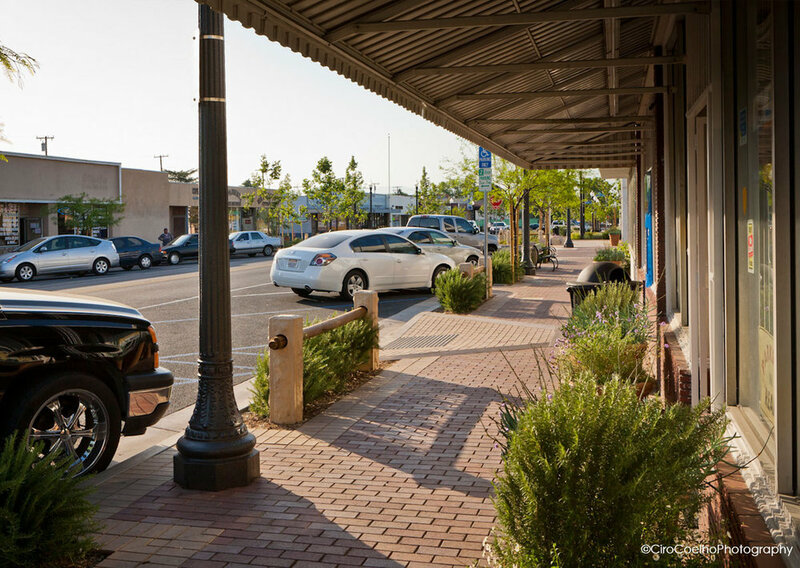 As impervious paved surfaces become more prevalent through urban growth, pollution and stormwater runoff management are becomming increasingly important problems; thus, bio-swales are becomming even more desirable. On the downside bio swales are often developed without much attention to aesthetics. 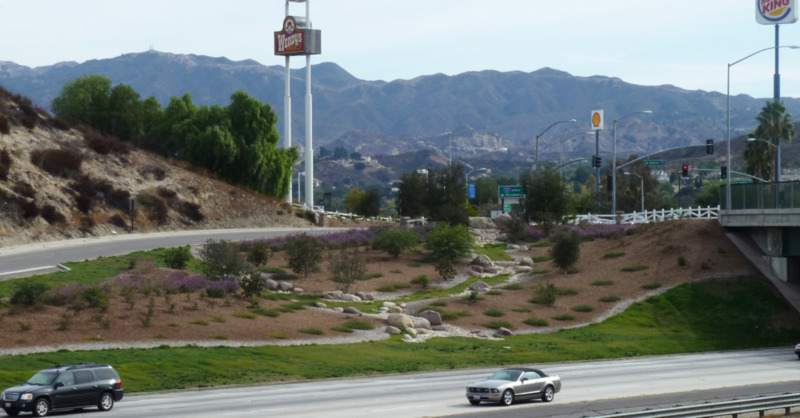 For the Lyons Avenue/I-5 ramps in Santa Clarita, bio swales are the centerpiece of the landscape. They are modeled after the gently sloping oak woodland/chaparral arroyos that define the native character of Santa Clarita’s west side. The site has gently meandering swales adjacent to each ramp. 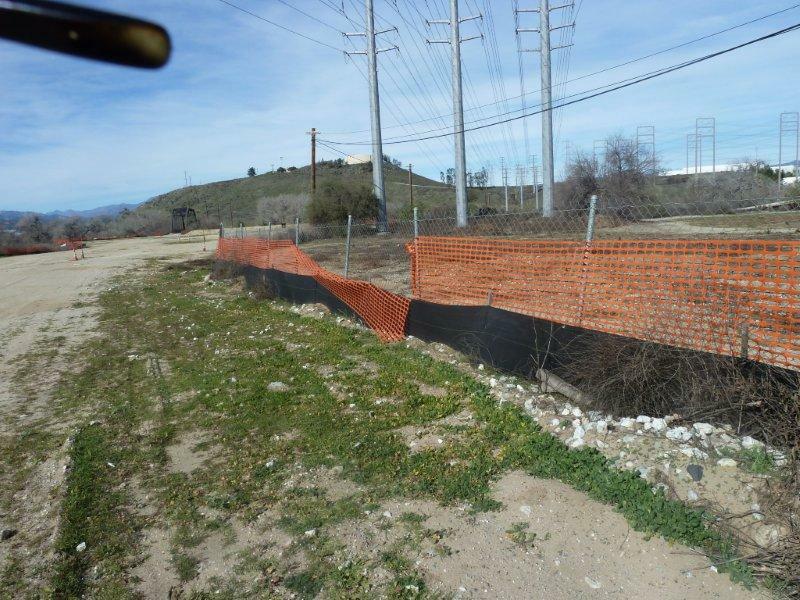 Design tasks included strengthening the existing swales, reducing the swale gradients and drawing from the existing native/naturalized landscape that defines the character of Santa Clarita along its western edge. Additional mounding soil on each side of the existing flow lines was added to better contain the water flow within the swales. The biggest problem was that the swales were too steep to allow for good soil percolation – about 10%. This was addressed with vertical boulder drops, acting as wiers or small dams. Cobble was added below the drops to absorb erosive energy and to direct the water flow. The boulder drops reduced slope gradients between the elevation changes to a level that allowed better percolation. The native grasses are Fescue Rubra ‘Molate’ and Argostis Pallens. These drought tolerant grasses are naturally dormant during dry months. During wetter months, and if they are watered, the grasses remain green. The design intent was to specify a grass that need not ever be watered after establishment, as well as a grass that could remain green if the City felt it was important. In a couple more years, if the City chooses not to water this landscape, the drought tolerant natives will remain. As with all Caltrans projects, and with nature itself, it will be several years before the beauty of the project is fully expressed. But we think this project takes an important step forward in the development of sustainable landscapes that are also beautiful. When the container plants grow together, the City may let the grasses go dormant in the summer... Just like the surrounding hills. Santa Clarita’s Iron Horse Trailhead officially opened last week. 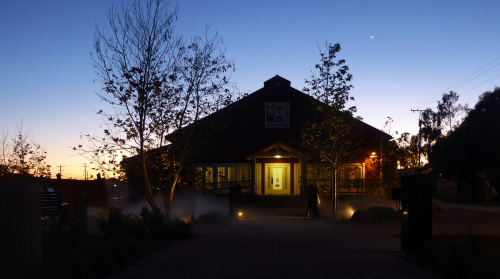 The trailhead is a nexus for recreation and commuter bike trails throughout Santa Clarita. Walkers, joggers, bicyclists and equestrians attended the ribbon cutting ceremony. 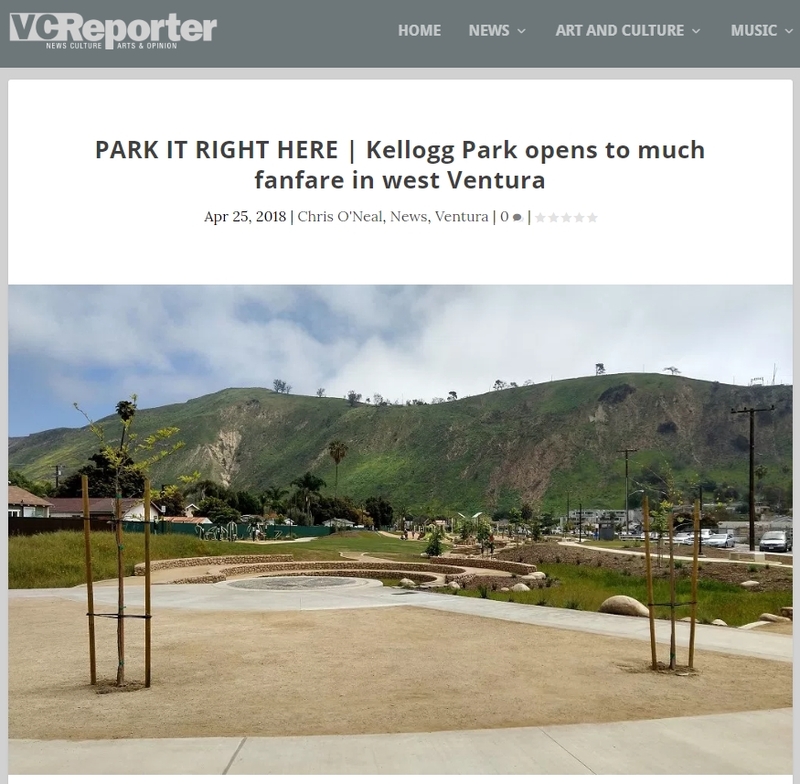 Someday this trailhead will be part of a system that connects the beaches of Ventura to the Angelus National Forest beyond Canyon County. The four-mile horseback and bike trail around Iron Horse has been years in the making. Its centerpiece is the historic, 1898 railroad steel truss bridge adjacent to Magic Mountain Parkway, which connects to the South Fork Trail. 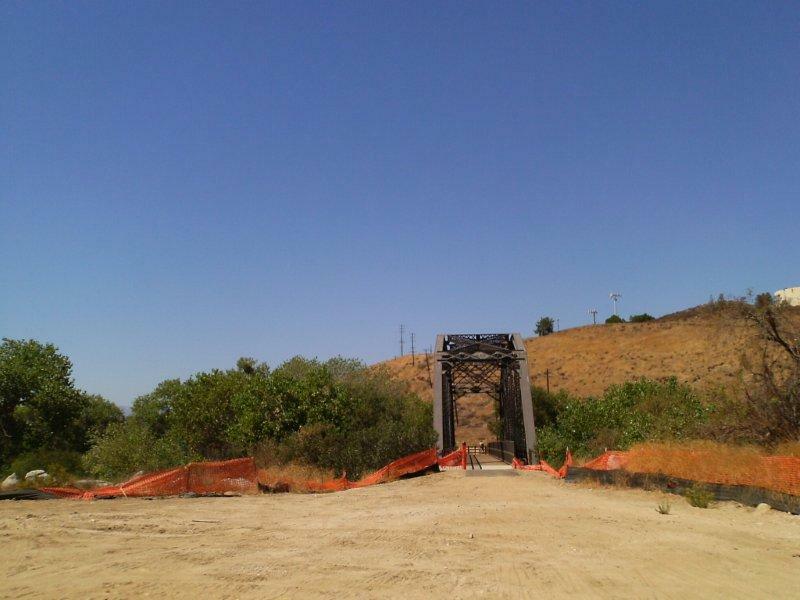 Before Construction, the site consisted of invasive grasses and mustard, trash, and a bridge in decline. The Santa Clara River, which defines the northern boundary of the Trail, was and is lush with native vegetation. The trailhead is already an overwhelming success that will attract ever-more visitation. 971 visitors were counted in the first four days open, with over 6,000 projected for the first month. Typically, recreation trail visitataion rates double or triple the first year or two. Iron Horse Trailhead is the result of joint cooperation between Newhall Land & Santa Clarita Department of Parks & Recration. Newhall Land oversaw the planning, design and construction of the trailhead. Newhall Land master planned and built the community of Valencia which features many premier neighborhoods and community facilities in Santa Clarita and beyond. The City of Santa Clarita has overseen the design and development of one of California’s premier recreation and bike trail systems. The trails are used by commuters as well as recreation enthusiasts. Iron Horse Trailhead reflects the best of public/private sector creativity and effort.